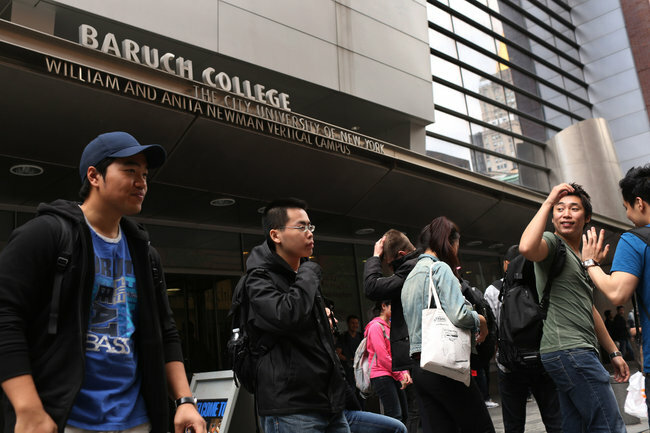 The enrollment at Baruch College is almost half Asian. More than a decade after the City University of New York ended open admissions to its four-year colleges, a marked shift has occurred at its top institutions as freshman classes now enter with far better academic credentials and also a different demographic mix. The changes began in 2000, with new minimum requirements for test scores for college admission, continued as academic standards were raised in stages over the years and accelerated sharply with the recent recession, as CUNY’s bargain prices beckoned far more applicants. At the university’s five most competitive four-year colleges — Baruch, Brooklyn, City, Hunter and Queens — nearly 12 percent of freshmen entering in 2001 had SAT scores of 1,200 or more. In 2007, for the last prerecession class, the figure was up to 16 percent, and by last fall, it had jumped to 26 percent. At the same time, black representation among first-time freshmen at those colleges dropped, to 10 percent last fall from 17 percent in 2001. Over the same period, the Hispanic share rose slightly for several years, then fell once the recession began, to 18 percent, while the white portion fell slightly, to 35 percent. Asians are now entering the top colleges in the greatest numbers, composing 37 percent of those classes, up from 25 percent a decade earlier. The ethnic changes at CUNY’s top colleges confirm the predictions made during the battle over ending open admissions, one of the city’s most charged political disputes of the 1990s: Proponents said the colleges would rise in status, while opponents said black and Hispanic enrollment would fall. The CUNY chancellor, Matthew Goldstein, said enrollment changes among first-time freshmen were a concern, but he noted that transfer students had outnumbered first-time freshmen at the five top-tier colleges for the past three years. The racial and ethnic mix has shifted among transfer students, as well, but not as drastically, according to CUNY figures. Across the country, the most selective public colleges have been growing more so for decades, with many of them seeing a notable shift in the past few years. The share of entering freshmen who were in the top 10 percent of their high school classes rose to 73 percent last fall from 69 percent in 2007 at the University of Texas at Austin, to 57 percent from 49 percent at Binghamton University and to 80 percent from 76 percent at the University of North Carolina at Chapel Hill, to name a few. “There is plenty of evidence that our flagship public universities have been growing more selective for 30 years, with a decided uptick in this recession,” said Barmak Nassirian, associate executive director of the American Association of Collegiate Registrars and Admissions Officers. Whether there has been a resulting demographic change is unclear, because most colleges have changed the way they record racial data, and in some states, new laws banning affirmative action have influenced enrollment. With 12 senior colleges, 6 community colleges, several graduate schools and about 260,000 students in degree-granting programs, CUNY is one of the largest systems in the country. Unlike most public and private universities, its admissions are race-blind, based entirely on grades and test scores. Tuition for the next school year will be $5,430 for a New York State resident who is a full-time student at a four-year college, one of the lowest prices in the country. Considering the charged debate that surrounded the decisions to establish and then to abolish open admissions, the greatest surprise may be how little political noise the results have generated. For almost 30 years, beginning in 1970, CUNY admitted any high school graduate to at least one of its colleges, though that meant admitting many who needed remedial courses. Enrollment surged, graduation rates dropped, and more high-achieving students went elsewhere. Pressed by Mayor Rudolph W. Giuliani, CUNY’s senior colleges stopped accepting students who needed remedial work, and generally required applicants to meet minimum standards for SAT scores and other measures. Dr. Goldstein said the system’s increased use of transfer enrollment had been a success, with those students performing as well at the top-tier colleges as their peers who started there. A typical transfer student does not have good enough high school credentials to win acceptance directly to the most selective colleges, but is admitted after a successful term at a community college or a less-competitive senior college. The ethnic changes at those colleges have been less pronounced than at the top five. But Lazar Treschan, the director of youth policy at the Community Service Society and an author of the report, said that transfer students typically received one or two years’ benefit from a top college, rather than four, and that there were still far too few students making the jump from community colleges to four-year institutions. “Saying ‘we’ll let in more black and Hispanic students, but only after they’ve already had a couple of years of success in college’ really skews what we mean by opportunity and diversity,” he said. The changes at CUNY mimic, to some extent, changes in the city’s top public high schools, which admit students solely on the basis of an entrance exam and have become steadily more Asian and less black in recent years. The shift is evident in the faces at Baruch College in Manhattan, where the enrollment is almost half Asian and about 10 percent black, a regular topic of discussion, said David Mayomi, 33, a black student who studies international business and lives in Brooklyn. “This is our city, and we represent a large part of the community, but we represent a small percentage of the people here,” he said, questioning whether the college gave preferential treatment to Asians. Another student, Joyce Chan, 21, said that when Asian students chose to attend a CUNY college, their parents often pushed for Baruch because of its specialty, business education. A graduate of the Bronx High School of Science whose parents are immigrants, Ms. Chan was initially accepted into Baruch’s honors program, which offered her a free computer, an iPod and a travel stipend, in addition to complimentary tuition, she said. But a recent F grade in a math class forced her to withdraw from it. At another four-year college, the John Jay College of Criminal Justice, a number of students said it had not been their first choice of a CUNY campus. “It was actually, like, my third,” said Brian Mercedes, 20, a junior from Manhattan who is studying criminal justice. He said he was one of several students he knew in high school who wanted to go to Baruch but did not get in. Students at Baruch and John Jay said they had been warned in high school that CUNY colleges, particularly the top tier, had become more selective. “The SAT scores for all of these schools are going up, but I was still pretty surprised I didn’t get into Hunter,” said Charles Cooper, 19, who is from Manhattan and is an economics major at John Jay. He said he might transfer to a more selective college.